The field of primatology has reached the stage where there are sufficient long-term studies and many shorter investigations on the same species at many different locations, in which we are able to appreciate how variable the behaviour of primates can be and how predictable their environment is over space and time. For example, redtail monkeys (Cercopithecus ascanius) exhibit extreme flexibility in diet; i.e. within the same national park, the amount of time they spend eating fruit varies from 36 to 60% of their foraging time, and among populations, time spent eating fruit ranges from 13 to 61%. Similarly, long-term phenological data from the same area encompassing over two decades illustrate that fruit availability can vary among years by as much as eightfold. While data have steadily accumulated on how variable primate behaviour and proposed environmental predictors of behaviour can be, this information has not been used to effectively re-evaluate theory. For example, current primate socioecological theory has derived general frameworks using the average behavioural traits of species or genera, but these new data suggest it is inappropriate to use such averages. Similarly, environments have often been characterized by single studies of 2 years or less, which does not sufficiently account for environmental variation. Here, we present examples of behavioural and ecological variation and consider ways that our field could advance in the future by considering this variation. 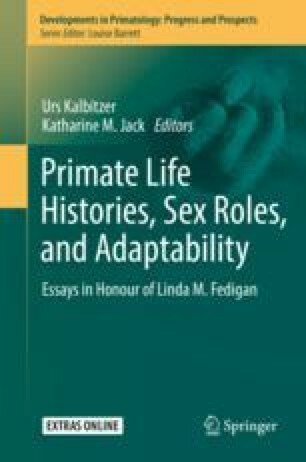 This paper is dedicated to Dr. Linda Fedigan who was so very influential to Colin Chapman starting his research career when he was an undergrad, supervised him through his graduate degrees, and then has provided critical mentorship and letters of recommendation to this day. Funding for the research in Kibale National Park was provided by the Canada Research Chairs Program, Natural Science and Engineering Research Council of Canada, Fonds Québécois de la Recherché sur la Nature et les Technologies, and the National Geographic Society. Tom Struhsaker has been particularly helpful over the years with sharing long-term data and opinions, and Karen Strier provided stimulating ideas and discussion on variability and flexibility. Finally, we would like to thank Urs Kalbitzer, Kathy Jack, and the anonymous reviewers for helpful comments on the manuscript.